August 14, 2010. Tags: Ian Somerhalder, L.J. 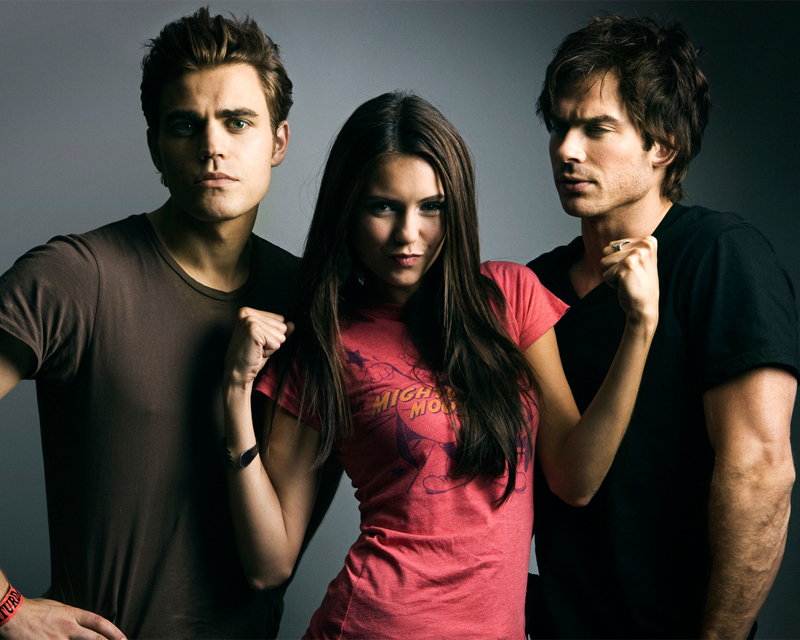 Smith, Nina Dobrev, Paul Wesley, The Vampire Diaries Season 2. Celebrities, Entertainment, Fantasy, Fiction, Horror, Mystery, Popular Culture, Supernatural, Suspense, Urban Fantasy. Comments off. July 31, 2010. Tags: bloopers, gag reel, Ian Somerhalder, Nina Dobrev, outtakes, Paul Wesley, The Vampire Diaries, The Vampire Diaries bloopers, The Vampire Diaries Season 2, TVD 2S Preview. Celebrities, Comedy, Entertainment, Fantasy, Fiction, Horror, Mystery, Popular Culture, Supernatural, Suspense, Urban Fantasy. 1 comment. The Vampire Diaries Season 2 Scoop and Spoilers!!! You can listen to the entire three-hour discussion right here. …”VD” executive producer and writer Julie Plec sat down for a THREE HOUR confab with The VRO to chat about the growing Elena-Damon-Stefan love triangle, Tyler Lockwood’s true nature and whether beloved Anna will ever return. When last we left Damon he was smooching Elena, or so we (and he) thought until moments later when she whipped out that big butcher knife and let us know she was really Elena’s look-a-like, naughty vamp Katherine. So will deceived Damon continue to woo Elena in the upcoming season? “The only thing I can say about them for season two, is that it’s going to be a very profound triangle,” Julie said rather coyly, though she did drop a few hints. “Damon’s still got a long way to go until he’s man enough to deserve Elena. But he has a strong pull, a strong draw.” But with Katherine stalking Mystic Falls, Julie says to expect more of a “love square.” Though I was never good at geometry, that does sound rather intriguing, no? Go read the entire thing for scoop on Tyler and werewolves!!! May 28, 2010. Tags: Ian Somerhalder, Julie Plec, Kevin Williamson, L.J. Smith, Nina Dobrev, Paul Wesley, Steven R. McQueen, The Vampire Diaries S2 Spoilers, The Vampire Diaries Season 2. Celebrities, Entertainment, Fantasy, Fiction, Horror, Mystery, Popular Culture, Supernatural, Suspense, Urban Fantasy, Warner Bros.. Comments off. I miss these shows already and it has been a week, sigh. Katy Perry just performed live at the CW upfronts for advertisers sounds like she got them on their feet! 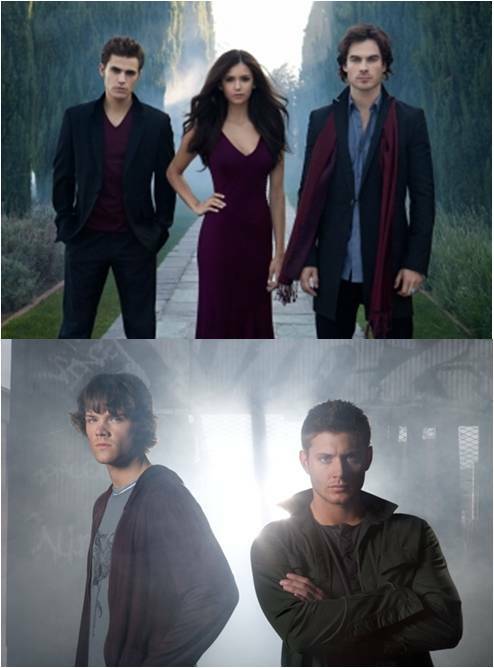 …The big news is that Supernatural is moving to Friday nights at 9 p.m. ET, after Smallville in its 10th and final season at 8 p.m. This reunites the shows that once worked so well for The CW on Thursday nights. As for Thursdays, The Vampire Diaries continues to kick off the night at 8 p.m., with Maggie Q’s Nikita following at 9 p.m…. Next season, the appearance of the villainous Katherine in Mystic Falls throws a wrench into the love triangle between Stefan, Elena and Damon, and the other residents of Mystic Falls must choose sides as they fall victim to a new breed of danger. New and unexpected friendships will be forged, allies will become enemies, and hearts will be broken. Stefan and Damon will be forced to face a villain more evil and diabolical than they ever believed possible. And they’ll take their shirts off. Frequently. May 20, 2010. Tags: Ian Somerhalder, Jared Padalecki, Jensen Ackles, Nina Dobrev, Paul Wesley, Supernatural Season 6, The Vampire Diaries Season 2. Celebrities, Entertainment, Fantasy, Fiction, Horror, Mystery, Popular Culture, Supernatural, Suspense, Urban Fantasy, Warner Bros.. Comments off.